Grooming is something that all pets need at one time or another. A good washing, hair cutting, and nail cutting can keep a pet looking beautiful and can keep it healthy. Having the right pet grooming supplies is essential to making this process simple to do and easy on the pet and the pet owner. The dog grooming equipment that are offered here can help to make this process easier on the back and on the pet, due to its easy to use design. Pet grooming can be made much simpler with the simple addition of one of these machines. One of the most important facets of dog grooming is the washing phase and these components can put everything you need at your fingertips to get the job done right. With just one touch of a button, shampoo, conditioner, disinfectant, flea and tick repellant will be dispensed to allow you to get your pet as clean as possible. Then you can rinse and dry your pet with the touch of another button. All of these tasks can be completed with just one easy to use dog grooming equipment, which makes it easier on the pet and on the person doing the grooming. The meter option that is available can allow you to turn the dog grooming equipment into self-service machines that can give you a profit. These machines are available in coin, token, and bill operated versions to fit your needs and desires. The pet washing machines would make a great addition to a kennel, pet center, or veterinarian’s office. In this way, pet owners can clean their own pets, which will save them time and money over going to the groomer. All they need to do is walk their pet up the ramp and turn the machine on and clean their pet. This is a much easier option over cleaning their pet at home. Grooming can be made much easier by purchasing one of these dog grooming equipment. The pet grooming equipment can save time and energy, giving you more energy to do even more business or other activities. These pet washing machines are made of heavy-duty steel to stand up to the rigors of washing and cleaning pets of all different sizes. The 8-foot spray wand makes washing simple, as you can get around the pet easily and simply, no matter what their size. Whether you use the dog grooming equipment yourself for grooming your personal pets or if you are purchasing them as a money-making venture, you will find that the pet washing machines work easily and simply. 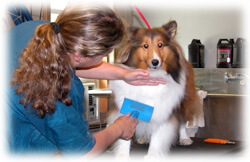 Pet grooming is a necessary activity if you have a pet. By having the proper tools, like these dog grooming equipment, you can make the process much easier on your body and on the pets that are washed. This will keep you, your customer’s, and/or the pets happier and more comfortable. Having the proper grooming supplies to do the job right will make the job easier and simpler for those customers who are using the self-service model and easier on the back of those who are using it in their grooming business.